Graduating this week, Randy Dwayne May Jr. He couldn’t imagine he would ever graduate from high school, or that he’d ever even have a chance. After being released from his second juvenile detention camp, Randy Dwayne May Jr. wasn’t sure what he was going to do. 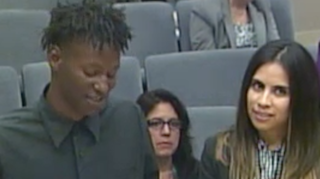 Then came a knock on his door over the summer from Wendy Cholico, a Pupil Services and Attendance counselor from LA Unified’s Juvenile Hall/Camp Returnee Program which started at the district two years ago and is being expanded this August. The program follows up on students who have gone into the probation system and helps reintegrate them back into a school community—and get them a high school diploma. This week, Randy is graduating from William J. Johnston Community Day School in San Pedro. “I am proud to be graduating,” he said. After a few months, he was assigned to Camp Kilpatrick on a burglary charge, and that lasted about eight months. Then he was assigned to Joseph Paige Juvenile Camp because of a probation violation. Another probation violation landed him in Camp Returnee where he connected with the LA Unified team of counselors. “I remember a time when I saw five different judges and had five different probation officers, it was crazy,” Randy said when he spoke to the Successful School Climate Progressive Discipline & Safety Committee in April. 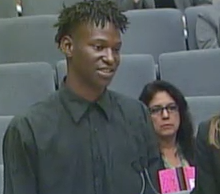 He later said speaking about his school troubles in front of the committee was “one of the scariest things I’ve ever done.” But he had his counselors, Cholico and Michael Hinckley from LA Unified, at his side. When Randy slipped up a third time, Hinckley set up meetings with Randy and his family to get them all involved. The counselors provide services to students who are in danger of educational failure. Randy Dwayne May Jr. with his counselor Wendy Cholico. Corral said more than half of the youth in the juvenile camps are from LA Unified schools and they are providing transportation and job training to eliminate as many barriers as they can to help with their education. He said the program is being replicated throughout the country at other school districts. For Randy, the program helped get him to graduation; something he thought was elusive only a few months ago. He has been out of a camp since last November. “That’s the longest I’ve been out of camp for a while,” Randy said. At graduation, his family and his counselors all attended. The counselors are going to help him enroll in Los Angeles Harbor College. He is thinking about going into the military. “And then I want to go to college to be a probation officer,” he said.